And this surprises who? Clinton helped to make them rich (and lots of folks think they raised tons of cash, to elect him)...........Bush did nothing to counter it. And now, we have a Marxist pretending to be POTUS. And they think the Free Masons are the conspiracy that controls the world! Anyway..............you may not think you are a troublemaker, but you are! Nah; he's not a Marxist. He's just a wimpy version of that Clinton guy. If you look really closely, he's actually more conservative in his policies than Eisenhower was. Or Reagan. Or even Nixon. I'd have much preferred Pat Paulsen. 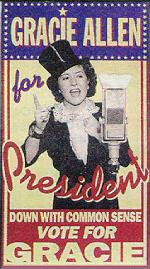 Or Gracie Allen. Well...........we can't always get what we want. But, yes. Anyway, tax rates under both Nixon and Eisenhower were really, really high. And, it wasn't because of an unfriendly Congress, either. They just both believed that giving wealthy people lots of tax breaks would cause them to invest in things that weren't good for the overall economy. This is why capital gains taxes (so-called unearned income) were higher then as well. Reagan oversaw the largest peace time tax rate increase in the history of the country. (Something like 1% of GDP in 1982) He was conservative, but also pragmatic. That's wealth redistribution, isn' it? At least to me, the problem is the way taxes are structured. Capital gains should be taxed at a higher rate, much higher, than they are. That way CDO's and all that BS would be less attractive. Earned income, which includes investing in actual going businesses designed to employ people and make money, should be taxed at a lower rate. Where would the investment capital go then? But I are as dumb about this as we am about distortion measurements. If anyone want higher taxes, we can always swap positions. Why? Because I am participating on this forum? Using those 2 is not a convincing argument. The economy was so good, under Nixon, that folks were clamoring for price controls. So many jobs that I was planning on spending the next 8 years, in the Army. Luckily, the Army came to their senses, first. My *only* point is that no matter how you package these guys, they all lend support to the people who speak loudest in their ears, which generally means the ones who've paid the most. Unfortunately, they have to say what their handlers decide is the politically most advantageous, since they still haven't been able to work out how to totally bypass that vote thing that happens in November. (They're working on it.) So, they say what sounds good to get the votes at the time and then pretty much do a variation of the same thing every time. Meet the new boss. Same as the old boss. Haven't you ever listened to the lyrics from Joe's Garage, Acts I, II, and III? You know the answer to the last question. 1.) He wasn't the previous boss, and since everyone was sick of that guy, he had the inside track. 2.) Some folks thought it would be a good idea, to show what a nice bunch of people we are, that we should elect someone that had to overcome a certain prejudicial barrier, regardless of what he said. 3.) And he did say "We are 5 days away, from fundamentally transforming the United States of America." Well, I don't like Europe..................I don't like being like Europe.............and I will do everything I can to stop that. Unless it means voting for a lesser form of fascist. Every time I do, there is one guy who "doesn't get it". I'm not expert on I/V stages, but latest development shows "he really doesn't get it". Have someone saw a ES9018 or ES9012 on DIP socket ? you do realise they both have a need for 7 different power supplies, which all need high quality decoupling and run at a speed that will look ugly as hell after a dip socket right? Yeah, but this is digital! As long as the bits are right, everything is fine. That'll be 7 points against you, mister!